Last year, I was so enamored with the Miho Museum in Japan that I posted about my general experience rather than about the particular art pieces inside it. This year, I found myself responding to Museum SAN (Space Art Nature) in South Korea in a similar way. In both cases, as well as when I visited the island of Naoshima in Japan's Seto Inland Sea (2012), it is all about the environment and how the architect worked with the site to create art that, in turn, houses art. I always wished to create a place that could provide the 'energy for life'— nourishment for the mind that will last even when one becomes a hundred years old, restoring the energy to children to run and shout for joy in nature, who had lost their vitality overstressed by the cramming educational regime. Therefore I did not want to build an ordinary museum that is like a silent box, and this site was a perfect spot for realizing my plan. Although not far from Seoul, getting to Oak Valley was not a simple hop, skip, and a jump except by car. In fact, I wanted to go there during my trip to Korea last year, but couldn't work out the logistics. Thanks to a friend living there, it was an easy and lovely outing this year. Getting to the ultimate view in the photo above entailed a process of moving along walkways and through gardens from the minute we arrived. After paying the entry fees, we followed the signs to visit each part of the museum complex, such as the sculpture garden, where we walked around to view the different sculptures, surprisingly all by Western artists. "Temple" (1990), by Anthony Caro. "Realization of a Dream" (1994), by Mark di Suvero. "Untitled" (1995), by Joel Shapiro. We emerged from the garden and onto the path leading to the museum building. 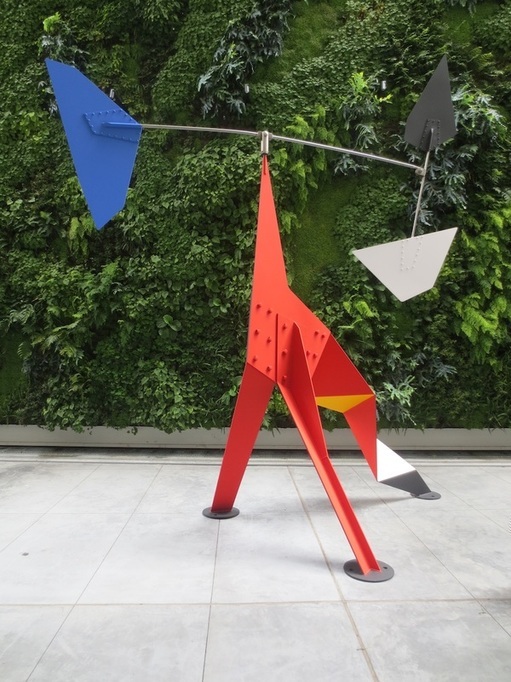 Sculpture by Mark Di Suvero. As we walked along, we passed a woodland and got a glimpse of what was ahead of us. "Archway" (1998), by Alexander Liberman. I was especially attracted to the entryway because of the constantly changing secondary abstract art created in the "infinity" pools filled with pebbles. Depending on where the light is casting shadows, the images provide inspiration for one's own artwork. The formation of interesting shapes and angles is a factor throughout the complex. Once inside, there are more visual treats in the rectangular, triangular, and round spaces. Through horizontal slits in the walls, you can barely glimpse the Triangular Court, with a water sculpture by Eric Orr set amidst rocks that moved with each step we took. Inside, the lines of the concrete planes shifted according to position. A romantic spot viewed from an opening. Inside the building, there is an exhibit of modern Korean paintings as well as the Hansol Paper Gallery, which recounts the history of paper and displays traditional Korean paper products (case for thread, brush stand, chamber pot, clothes wardrobe, and more) and book covers. Each section is worth its own post. Here are only two examples of what's in the paper exhibition, which was almost without any light, I suppose in order to preserve the objects. Chamber pot made of paper. Next, we leave the museum building and enter the Stone Garden, en route to James Turrell's installations. This area was inspired by the royal tombs of the Silla and Unified Silla Kingdom (1st c. BCE - 10th c. CE). "Couple on Two Benches" (1985), by George Segal. More sculptures set in the stone garden amidst trees turning color. "Willy" (1962), by Tony Smith. "Undetermined Line" (1992), by Bernar Venet. You might wonder why I'm including the following signs rather than images of Turrell's work. No photography is allowed inside, only outside. I'm not sure why except that being in these installations is a multi-sensory experience that can't be captured by a picture alone. Sometimes the effect was so disorienting that I felt dizzy. There were even minders to make sure we didn't drop off an edge that appeared to be the floor meeting a wall, but wasn't. In fact, despite all the photos in this post, it is undeniable that being somewhere--walking, hearing, seeing, smelling, feeling--can't be replaced by photos. But if you can't get there, I hope that these give a sense of what a wonderful place Museum SAN is to visit. What places of art have you found noteworthy? What about them made you consider them exceptional--the architecture, natural environment, sensibility in weaving together different elements?